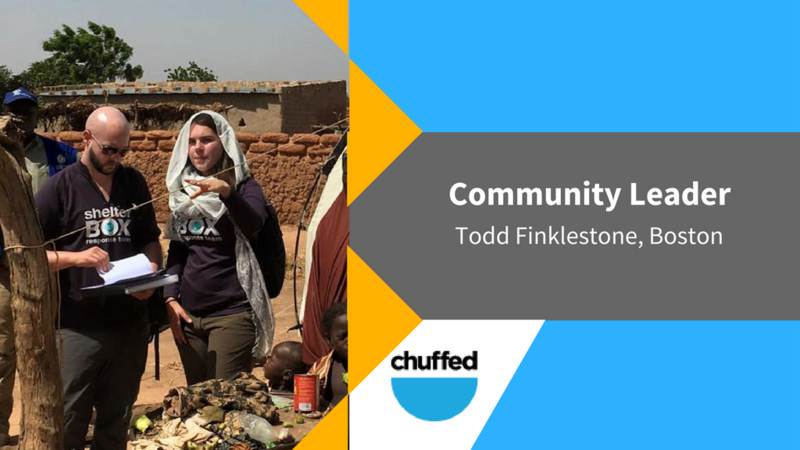 Meet Todd Finklestone, Chuffed.org’s Boston-based Community Leader. Hello. My name is Todd and I am from Boston, Massachusetts. I am the founder of a nonprofit organization called CameroonONE that specializes in privatized foster care in the Republic of Cameroon - we take parentless children from their orphanages and place them in the households of surviving family members and sponsor all their education, health needs, and caretaker support. I am also a Response Team Member for ShelterBox International, an NGO that provides emergency shelter to families displaced by natural disasters and manmade conflict across the globe. Chuffed.org is the best platform for charity crowdfunding. Chuffed's philosophy to dispense all donations for charity causes to the organizations (without taking an administration fee) demonstrates their sincere concern and respect for donor accountability and appreciation for the the efforts of charity organizations' volunteers and staff and their causes. I discovered crowdfunding during my efforts to secure funding for the charities that I am invested in. I discovered Chuffed through an Australian teammate of mine while on deployment, I have been a loyal Chuffed supporter since, recommending it to everyone in the fundraising community since. CameroonONE because it is a personal project of mine, and ShelterBox because I am a member of their Response Team and an ambassador for our US affiliate. I have range of experience in the Non-Governmental Sector, mostly in international development. Also, I've been fundraising for CameroonONE for a while - for example, raising money to help support children’s scholarships, and organizing supply drives for school gear, medical equipment and clothing. I can talk about what I've learnt on the way. CameroonOne - click here to see our campaign.